PLEASE NOTE: This is the first draft -- we will accept comments, suggestions, additions, support or criticisms for the next couple of weeks and then will issue the final Manifesto in due time. If you would like to also be one of the sponsors, let us know. This initial draft was written by Rick Doble, but he expects that when completed it will be a work in which many have contributed. We draft the following Manifesto because we are annoyed by critics who make unsubstantiated claims that Time-Flow Photography is purely accidental although it does, in fact, require more skill than traditional photography. And further we offer this Manifesto because we are also angered by pronouncements that Time-Flow Photography is not a legitimate form of photography. TIME-FLOW PHOTOGRAPHY DEFINITION: We define 'Time-Flow Photography' as one that deals primarily with slow shutter speeds and movement that is visibly recorded in a photographic image. The movement can be camera movement, subject movement or a combination of the two. The word photograph comes from two Greek words: Photo = light and Graph = drawing or painting. Photography is the art of light on light sensitive material -- no matter what form that art takes. 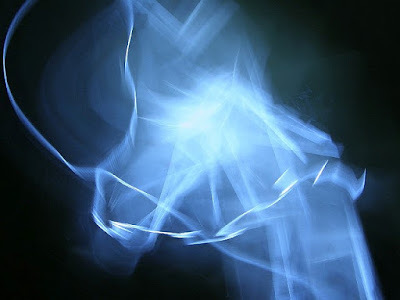 Therefore a photography of light recorded in movement is a valid form for the photographic arts. We reject the notion that valid photography must, for the most part, be sharp and realistic. For various reasons in the past (see below) sharp realistic photography has been most useful and therefore considered the standard for the photographic arts. But now with the new capabilities of digital, this standard is outdated. Deliberate artistic blurred images or images that show motion or streaks of light or a duration of motion are just as valid a photographic statement as traditional photography. SUBJECT MOVEMENT: Candid 4 second, telephoto, handheld, available light photography by Rick Doble. Used as a central image at the SCIENAR (Science/Art) Exhibitin Bucharest, Romania, 2010. 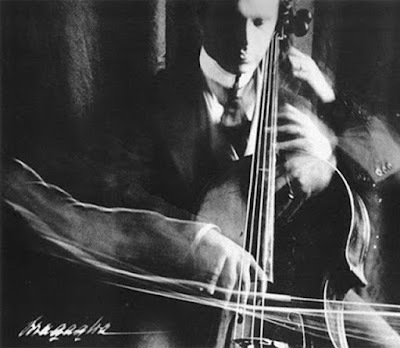 The idea of recording motion in photography was suggested over 100 years ago by Anton Bragaglia, a photographer associated with the Italian Futurist movement. The idea of light in itself being the subject was suggested 50 years ago by Wynn Bullock who spent six years, from 1959 to 1965 creating what he called "Color Light Abstractions" on 35mm Kodachrome slides. Anton Bragaglia (his photo above from commons.wikimedia.org) wrote his own Manifesto in 1911, Futurist Photodynamism (Fotodinamismo futurista) in which he described many of the same ideas that are fundamental to Time-Flow Photography but were difficult to implement with the film and cameras of the time. He wanted to understand unbroken movement with precision -- and he wanted to put together what he called an "algebra of movement." Light to me is perhaps the most profound truth in the universe. My thinking has been deeply affected by the belief everything is some form of radiant energy." "Light used in its own right...gives to photography the wonderful plasticity that paint gives to painting without loss of the unmatched reality of straight photography." Wynn Bullock (1905 - 1975) writing about his "Color Light Abstractions"
Experimental digital photography has the potential to create abstract expressionist pictures with the depth and quality of traditional painters but with light as the medium -- light which has characteristics all its own. CAMERA MOVEMENT: This photograph was created entirely with camera movement and a still shaft of light: 4 second exposure, handheld and white balance set to give the light a blue color. By Rick Doble. Exhibited in the Bridges Mathematical Art Galleries at the Bridges Conference in 2012. In the past the effects possible with slow shutter speeds were virtually ignored due to the expense and uncertainty of the results and the desire to create only sharp imagery for documentation. While time-flow effects were possible with film, the result were haphazard, time consuming and expensive so for all practical purposes slow shutter speed effects were not used or explored. Now however, digital photography allows a range of expression and an ability to experiment that was not possible with film because of the immediate feedback of the digital image and the low cost. Rick Doble wrote an essay about this over 15 years ago. In particular, candid digital photography is now possible with 'Time-Flow' effects -- which allows an immediacy and spontaneity that was first imagined by the Italian Futurists over 100 years ago. This means that difficult photographic imagery can now be crafted using a variety of slow shutter speeds and types of movement. Almost from the moment photography was born, it has evolved and changed. But the standards of the past have often mistakenly been applied to the newer technology. Now with digital photography, the new possible imagery with Time-Flow Photography is being criticized by outdated notions that prohibit most kinds of blur or visible motion in a photograph. From the very beginning photography has been changing. The first photograph by Niepce around 1827 required an eight hour exposure. About fifty years later Muybridge was taking photographs at 1/2000 of a second. Each technological advance in photography (from large tripod view cameras and collodion wet plates to handheld SLRs that took roll film, from black and white to color) led to new imagery but not without controversy. When small 35mm cameras became available their photographs were considered vastly inferior to the earlier large format cameras, for example. We reject the notion that these images are purely accidental as some critics have asserted. At its most complex, this type of imagery requires more skill than traditional photography -- and does not happen by accident. The exact techniques have been described in detail by Rick Doble in his book, Experimental Digital Photography. Like any new experimental art form there will be trial and error at the beginning which in time will evolve into specific techniques over which the photographer will have full control. As Einstein pointed out, we do not live in a world that is purely space, we live in a space-time world. Time-Flow Photography has the ability to record time as well as space and to make visual our space-time existence. A photographic 'exposure' is created by the combination of light through the lens for a specific period of time (the shutter speed). Therefore photography is uniquely capable of recording a space-time image because a photographic image is the combination of space (through the lens) and time (via the shutter speed) -- so each photo is a space-time picture. The dream and aim of recording the 'fourth dimension', that of time, is now possible with digital photography. A depiction of the fourth dimension has been a central theme of modern and contemporary art. 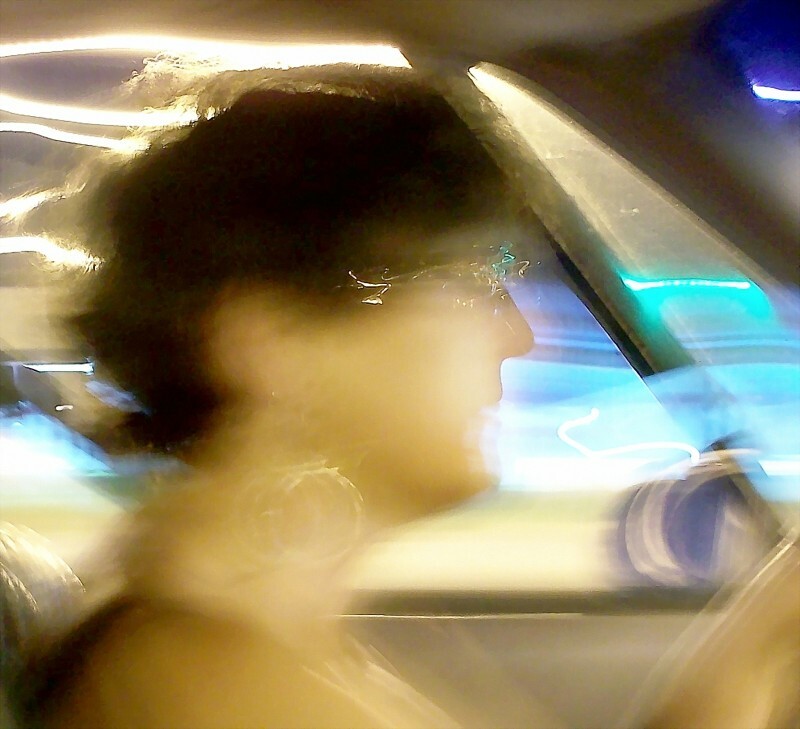 SUBJECT & CAMERA MOVEMENT COMBINED: The camera is moving relative to the background outside the moving car, but the camera is steady in relation to Doble's wife who is driving and whose movements are subject movements. Photograph of Doble's wife driving: 8 seconds, handheld, available light. Exhibited at the SCIENAR (Science/Art) Exhibit in Bucharest, Romania, 2010. NOTE: While we have named our kind of photography of slow shutter speeds with continuous motion, Time-Flow Photography, there may be a better name. It has been called space-time photography and also painting with light -- but neither of these, we feel, is as clear as the term Time-Flow Photography. One customer review said Doble's book Experimental Digital Photography was a "book about pictures you could easily take by accident." A new art form requires that people look at the works in a new way -- otherwise the artwork can appear random. When the Abstract Expressionists first exhibited their paintings in the 1950s, many said things such as "My kid could do that." Jackson Pollock's dripped paintings are now considered some of the best work of the 20th century and sell for millions of dollars. With Time-Flow Photography a new dimension has been added, the dimension of time. To the untrained eye these pictures might appear to be the result of luck but the best Time-Flow photographs are subtle and carefully constructed. However, most of us have been taught to avoid any kind of blur in a photograph -- so changing gears and seeing blur as an artistic technique does demand a new way of seeing. The notion of accident brings up another aspect. One mistake with such criticisms is that they often confuse accident with chance. Time-Flow Photography is not accidental, but it does take advantage of chance, which is quite different -- and is explained below. This photograph is not accidental. This shot might seem accidental to the untrained eye -- yet it is anything but. In heavy rain as Doble was driving, he turned off the wipers on his windshield and then he focused the camera so that it focused close-up on the drops of water on the windshield and also threw the lights on the highway out of focus due to depth of field. Next he waited to take this 8-second shot until he was the right distance from a stop light -- which he knew from past experience would create a web like red pattern and the red would also be reflected in the water on the highway. 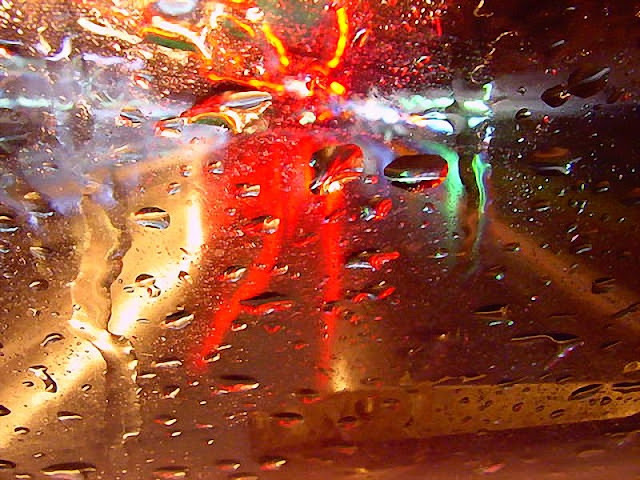 Then he steadied the camera on the dash of his car to eliminate camera shake to get a sharp picture of the water drops. Since the distance between the camera and the windshield was unchanging, the water drops on the windshield were relatively sharp. However, the approaching traffic lights at a slow exposure were spread behind the drops and out of focus. In addition because Doble had taken a number of pictures of water on glass, he also knew that each drop of water would act like a lens which would distort the light and the colors coming from the stop light and the traffic. Saying that Time-Flow photographs are accidental can only mean no skill was involved -- that the photographer had almost no control over the outcome. This is simply not true as seen by the explanation above. However, chance often plays an important role, especially in candid Time-Flow Photography. Dealing with chance is not unusual. In fact, we all deal with chance everyday, such as driving down the highway and expecting the unexpected. This can happen, for example, when a car in front of us suddenly comes to a stop for no reason and we must brake quickly to avoid hitting it. Chance is something we all live with on a daily basis. Candid photography for over 100 years has depended on chance to give its imagery an immediacy and a sense of the moment. Cartier-Bresson, who many consider the greatest photographer of all time, often framed a composition and then waited for a chance element to enter his camera viewfinder. But he could also compose spontaneously when the situation demanded. The exact moment when all the pieces came together, Cartier-Bresson called, "The decisive moment." 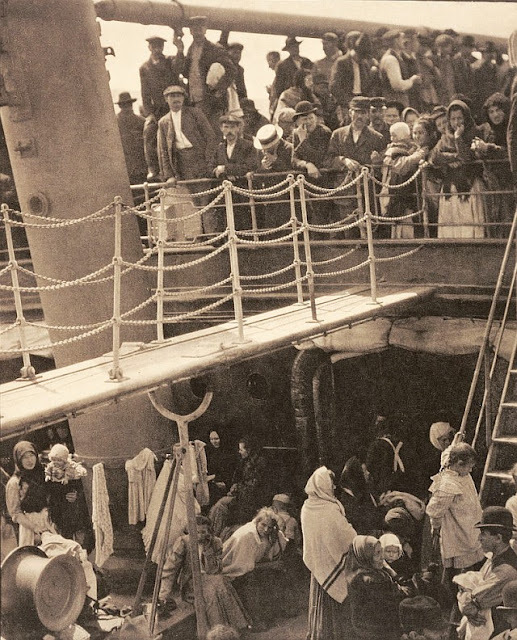 Considered a milestone in photography, Alfred Stieglitz came across this scene by chance when he was on a steam ship. He immediately saw the geometry and the stage-like arrangement, but crucial to the picture was the man in the straw hat (upper left) which was catching the sunlight. Stieglitz had to run back to his cabin, grab his quite large camera and return in the hope that the man had not moved. He was in luck. As Louis Pasteur so wisely said, "Chance favors the prepared mind," because it is one thing for chance to occur and a completely different thing to recognize and take advantage of it. Candid photographers are tuned into chance and make it part of their medium. "On the upper deck, looking over the railing, there was a young man with a straw hat...A round straw hat, the funnel leaning left, the stairway leaning right, the white drawbridge with its railing made of circular chains…I saw shapes related to each other. I saw a picture of shapes and underlying that the feeling I had about life." Both of these photographic art forms count on chance to give it a power and spontaneity that other forms of photography do not have. A candid Time-Flow photographer can create a framework in which chance can occur and then take advantage of such chance. For example, when taking photographs of musicians, a photographer might spend half an hour finding the right spot to frame so that the light, the colors, the background and the way a musician holds his or her instrument fits into a composition. 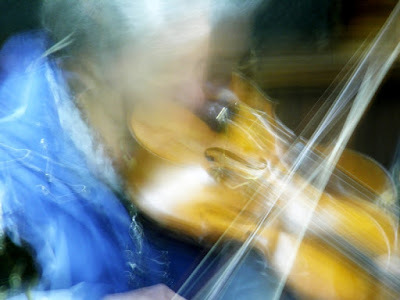 Then using a slow shutter speed the photographer will try to capture a sense of that moment, capture the rhythm and the energy in a picture that records the musician in motion. Chance has been a major component of modern art and contemporary art such as the art of the Surrealists, the Dadaists, the Abstract Expressionists in addition to candid photography or street photography. There is even a term for allowing chance into the art process: aleatoricism. "The marvellous mixture of emotion and geometry, together in a single instant." Time-Flow Photography demands that an accomplished photographer have a broad technical understanding of photography such as the interrelationship between focal length, aperture, depth of field, perspective, working distance and shutter speed; plus a knowledge of hyperfocal distance, circle of confusion, reciprocity failure, shutter speed and the desired effect, absolute and relative motion and ghosting or negative ghosting -- just to name a few, all of which need to be done manually and often quickly. But also, just as Ansel Adams said almost 100 years ago, photographers can learn to previsualize their photographs before shooting, i.e. see the scene the way the camera sees it and not the way the human eye sees it. A Time-Flow photographer can also use this method to previsualize what a scene will look like when exposed over time -- which with Time-Flow Photography is markedly different from what the eye sees. With years of experience a Time-Flow photographer can imagine what a picture will look like with movement and a long shutter speed before taking a picture. Consequently they can learn to zero-in on different and new lighting situations that will work with this technique. Minor White refined the idea a bit, calling the visualization before taking a picture, previsualization but crediting Ansel Adams with the basic idea.